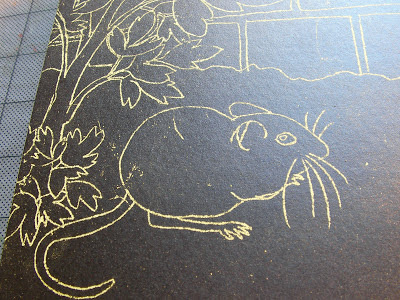 Aijung Kim: How I Made "April Mouse"
How I Made "April Mouse"
Most of you know that I'm a printmaker, but I'm sure that some of you don't know how exactly a print is made. It's not actually that mysterious, but it does require some trial and error and it helps if you can learn to "think backwards." And for some reason, I really enjoy that. Some printmakers are very process-oriented, and some like to try things out and see what happens. Either way, it's a surprise what happens. You can plan and plan, but never truly know what your print will look like until it's finished. That can be frustrating, but also part of the fun. I was asked by The Visual Arts Center of Richmond to contribute a 2-color print for a 2013 Calendar that will be handletterpressed by printer and teacher Paul Morris and other generous volunteers. Sales of the calendar will go towards buying new rollers for VisArts' platen press, which was donated by the Valentine History Museum and rescued from a life of storage. This collaborative, community project is being created by some local art-stars, including Diego Sanchez, Dennis Winston, Aimee Joyaux, Mary Holland, and others. The calendar date grid was typset by hand, and the images were created by artists using linocut, woodblock, lead typesetting decorations, and hand-drawn artwork converted into magnesium plates. The calendar will debut at VisArt's 48th Annual Craft + Design Show on November 17th and people will be able to take pre-orders until the limited edition of about 300 calendars is released to the public in December. I will now show you the process of creating the April calendar page. I call it "April Mouse." First, I think about the month of April and what it means to me. 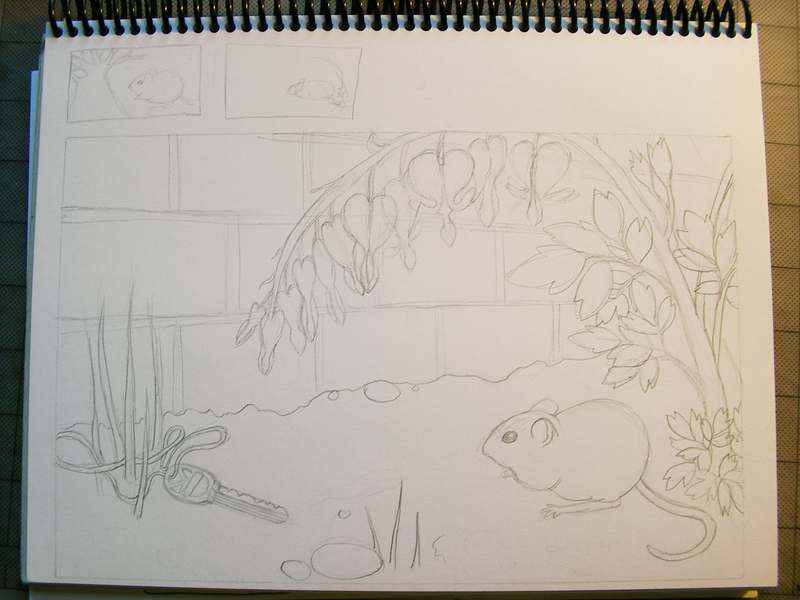 I wanted to incorporate Dogwood blossoms, but decide it doesn't really work with my composition because I want to include a mouse in there. So I research on the internet about an early-blooming plant and the Bleeding Heart is my choice. 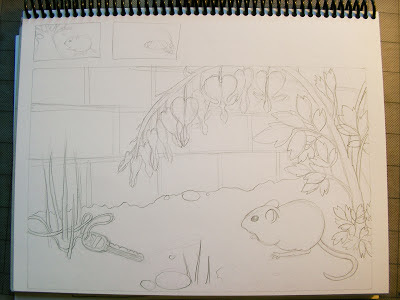 I search on the internet and print out some reference photos of mice and bleeding hearts, then sketch ideas until I come up with a composition I like. 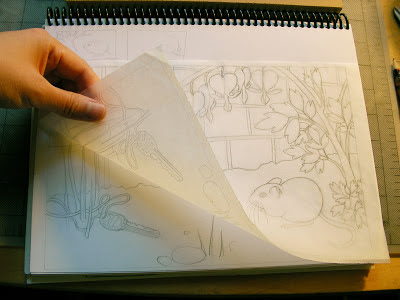 Then I trace the image onto tracing paper. Here is my linoleum block. 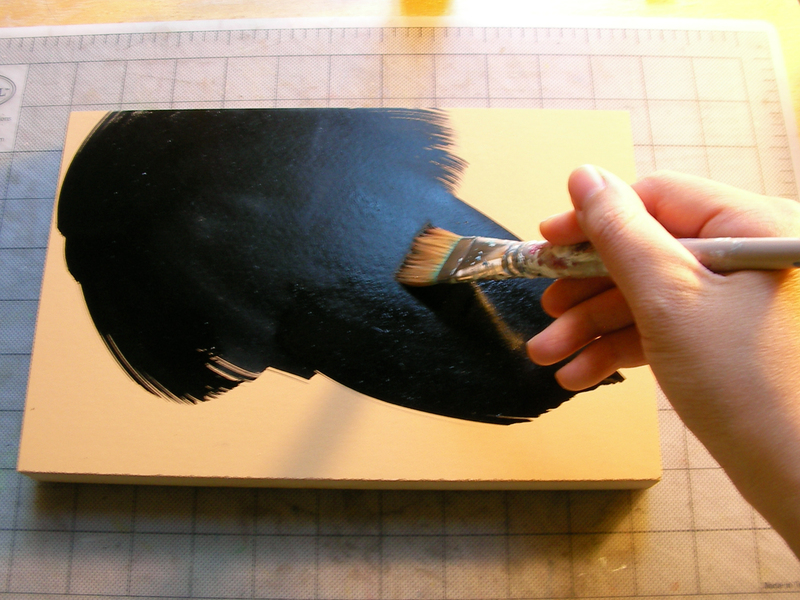 I like to paint the surface with India Ink (I use Rapidraw Black India ink by Rapidograph). The reason for this is that when I carve my image, it makes it easier to see which areas will not print and remain white - the carved areas - and which will print in color - the areas that remain black. Using a yellow carbon paper (yellow because I want it to show up against the black ink), I trace the image onto my linoleum block. But first I flip the tracing paper so that I'm drawing the reverse image. When the final block is printed, it will reverse again and the image will appear in the same position as the original drawing - see what I mean about "thinking backwards?" 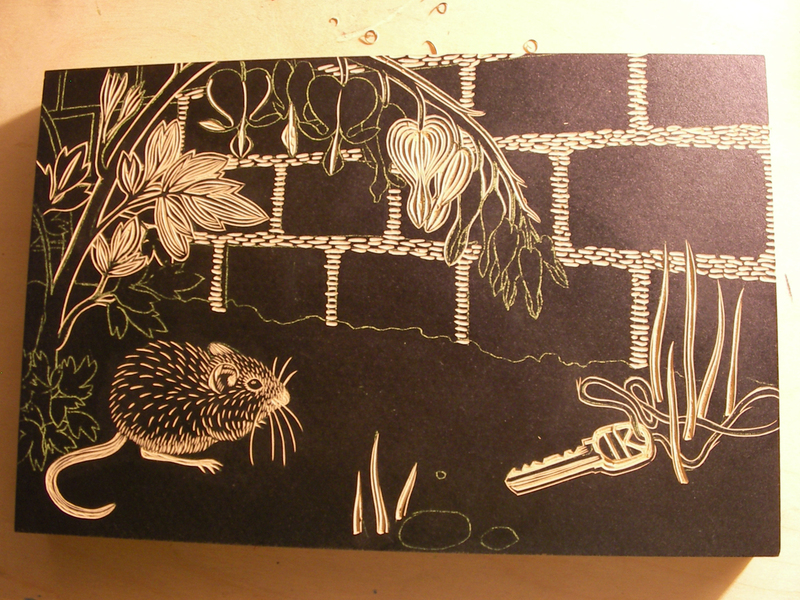 Then I begin carving - see the section with the key and grass. Some printmakers like to draw out their image exactly as it will appear, but I truly enjoy starting out with a black field and just my line drawing to guide me. 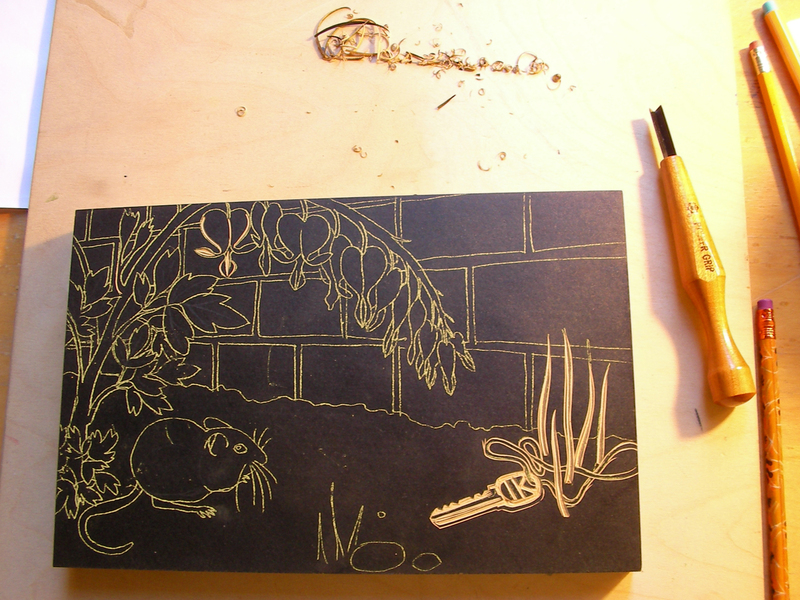 I have done many linocuts, so for me this is the most fun part and I get to "discover" how I will carve it. I also sometimes do tests on scrap lino to test whether I like the marks I make. And the first plate is carved! Then I proof my image. The print will be in two colors, brown and pink. The first plate is to be printed in brown. I set up a little make-shift print studio in my bedroom because these prints are just to help me check that I like my carving and to figure out where to place the next color. I roll up some brown ink on a cardboard slab covered with saran wrap (plexiglass would be better, but I had this on hand). 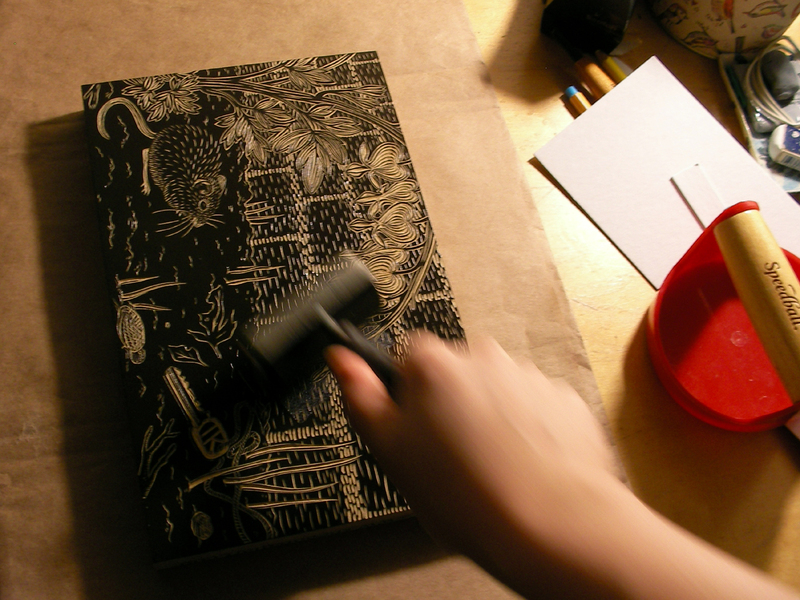 Using my brayer, I roll a nice even coat of brown and then transfer it onto my block. Then I place a piece of scrap paper over the block and rub the surface with a baren. This transfers the ink onto the paper. Here is the proof print. It's not perfect, but I don't need it to be for my purposes. Notice how the image is reversed? I let the print dry and then I go in with a pink colored pencil and color in the area I want to be pink. I take a piece of tracing paper and trace just the areas that will be pink. 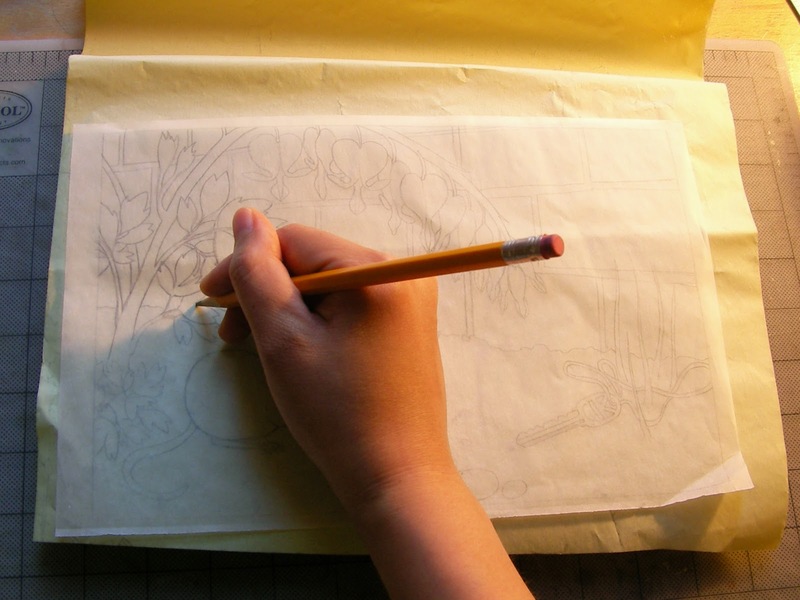 Then I repeat the process of transferring the drawing onto a 2nd plate using carbon paper. I carve my plate so just the areas to be printed in pink will remain. At this stage, I decide to proof the pink print. Here is the pink proof! Here are a couple of proofs of the pink and brown together. They look pretty crappy because I was trying to work fast and just test things out. I didn't wait long enough for my inks to dry, so more of the pink showed through than I would want for the final print. But the proofs are good enough for me to think that they will print fine. I decide I liked the darkness of the brown color in the top print, and the pink color in the bottom print. These are the proofs I will give to Paul Morris when he mixes up the colors for the printing of the actual calendar pages. And before I am ready to give the plates and proofs to Paul, I decide I will carve a bit more texture into the bricks. I don't bother proofing that step since I'm guessing that they will still look pretty good once printed. I usually print the plates myself on an etching press, but for the Calendar project it was going to Paul Morris to be printed on his vertical press at Benj. Franklin Printing Company. His printer is much faster! When Paul was ready to print my pages, I biked over there to watch him and okay the final print. Here's the studio! Lots of machines. Here is my pink block locked into the press. The ink appears red on the plate, but will print pink on paper. Here is a close-up. I also carved some little ornaments to go in the calendar grid area, which you can see on the right. Paul printing! The machine is fast and looks a bit scary, honestly. But Paul really knows what he's doing. And the pink is printed! We talk about how light I want the pink, and Paul is much obliged to get the color exactly the way I want. Paul lets me look at a Pantone color guide to figure out the color brown I want. I look at the handprinted proofs I gave him before and settle on a shade of brown. The next week I go in and help Paul finalize the brown color so he can finish printing it. And here is the final image! So as you can see, creating a print from start to finish can require a lot of planning. 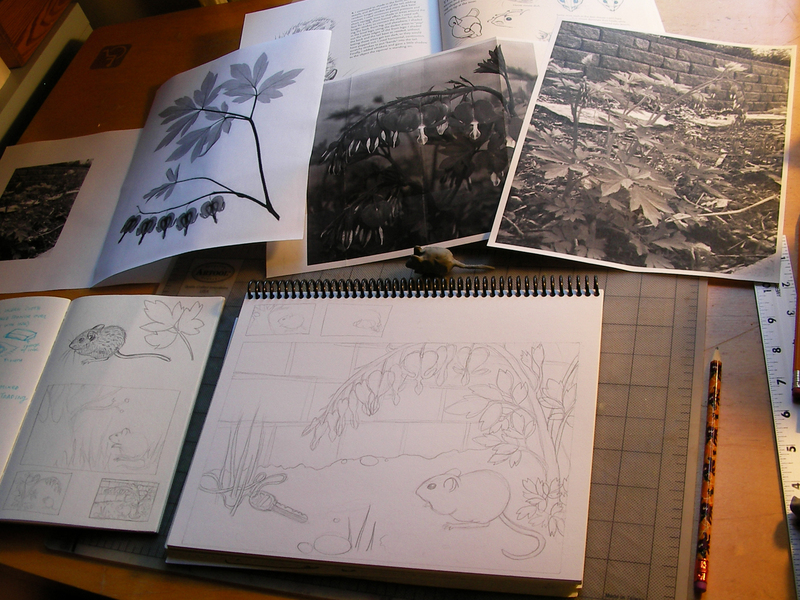 But I think it's worth it in the end :) I hope that seeing this has helped demystify printmaking a little bit. Let me know if you have any questions!﻿ And I will post more updates about this calendar project as it comes nearer to completion. Wow - that was very interesting. It did help demystify printmaking..
thank you! I hope you try it out sometime! what a fun post! so descriptive and pretty and lots of shout outs! thanks aijung!!!!! thanks aimee! i love your print in the calendar too! Of course I remember you guys! i hope the center is doing well and making lots of cool stuff! i'll come back to visit for sure. Oh, AiJung, mice are my thing! I will be getting this calendar because of your print. Let me know if there's an AP edition I could also purchase ~ I'll still buy a calendar, too! i already answered your question before, but for people who are also interested I will sell some of the prints on their own. not sure how much or how many i will have - i have to ask paul. i'm actually thinking about donating either all or part of the profits of the April Mouse print to charities/nonprofits. more on that once i figure it out. aijung! You are such an inspiration!! I can't wait for you to come to the QLMS show on November 17 and I'm am going to show these pics on printmaking to my art students at school. It's something like this that can change a life... a kid sees your blog... then he sees you in person ... hey, I can do that, he thinks! There will be lots of art loving adults there, not just students. 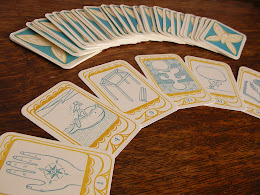 I already have a buyer for one of your goldenmoth decks sold so bring some! Thanks Debby! I hope some of the students enjoyed looking at the prints. I didn't get a chance to go all around the show, but I got really inspired in my area with ideas for new art. the show was really festive and i hope that you raised a lot of money for the school! Just wow!!! It looks awesome. It was fun to watch the process you went through when making this print. Thank you for sharing. thanks monica! you can print at home like i showed above, you don't have to have a press (although a press does help get a more evenly-printed image). i hope you experiment with linocuts!